Everyone who has flown it has been astounded by ability to fly slow in light winds or scream at high speeds around the sky. This model has the same aerofoil as the Blade 1.9 but is larger and comes in 2 pieces to aid transportation up to the slope. we recommend HS125 mg servo's for the ailerons and flaps. 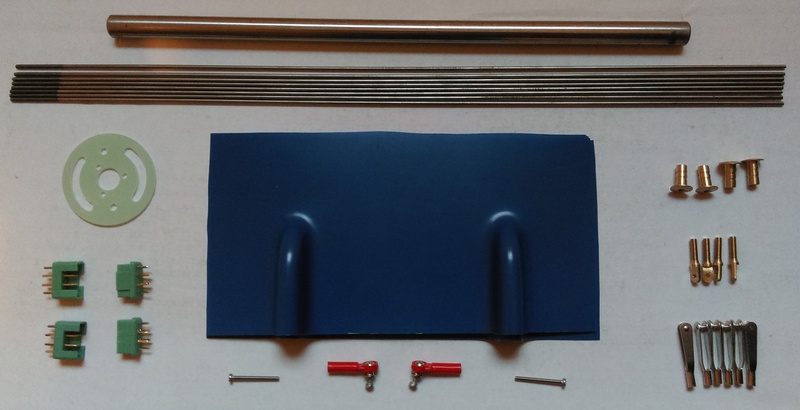 The V tail is made of 2 pieces and is detachable, this is made of glass fibre and we recommend 2 x HS85mg fitted in the fuselage for operation. The fuselage has a canopy type nose cone and a wide fuselage to allow for accommodating the flight battery. A motor may be fitted by cutting off the front of the fuselage and attaching the motor mount ready for the motor. 1 x 10mm wing bar, 1 x motor mount, 2 x carbon control tubes, 8 x m2 steel threaded control rods, 6 x m2 steel clevises, 2 x MPX connectors, 4 x m3 brass bushes, 4 x m3 brass screws, 2 x m2 threaded nylon cups, 2 x m2 threaded steel ball links, 2 x m2 9mm steel threaded bolts, 2 x m2 20mm steel threaded bolts, 2 x servo covers.